As you can tell, G+G loves a party. Every appropriate date we can find to throw a bash, you best believe Grind is dressed from floor to ceiling in themed decor. Maybe it's our way of showing that we always go all out for the joy of our customers. Or maybe we just love an excuse to dress up and celebrate! (Pretty sure it's a mixture of both). But, Valentine's Day is always a favorite at G+G. With our traditions of fancy dress and a full orchestra, G+G glows with the nostalgia of parties from the past. And it wouldn't be possible without our WONDERFUL staff pictured below. Thank you to them for all their hard work and thank you Vero for coming to our holiday parties! 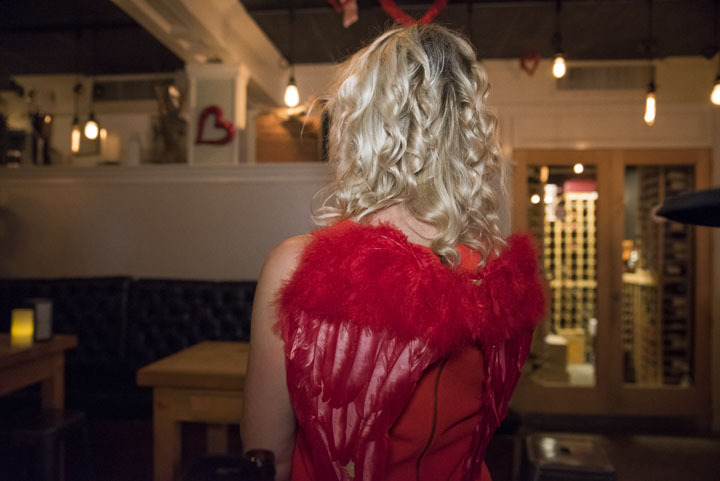 Our man, James, rocking cupid wings with pride.